Your skin is the largest organ and it takes a real beating. Bruises, burns, blisters, and cuts - our skin heals itself up nicely and keeps our guts safe. Things like moles, freckles, and birthmarks probably don't seem like a big deal - and generally they aren't. They can, however, be signs that something is going wrong. It's important to be able to determine whether or not your mole is something you need to worry about. Know your skin cancer ABCs. In a normal, benign mole, seen on the left, you should expect it to be fairly symmetrical. Both sides look about the same. 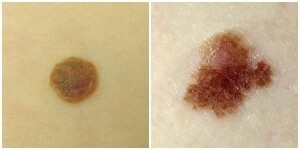 In the case of a Melanoma lesion, the cancerous kind of mole, they tend to be irregularly shaped, like the lesion above. Write for Simple Organic Life, follow other authors, and get the stories you care about most. © 2016 Simple Organic Life. All Rights Reserved.